and Trx suspension training certified. Constantly changing workouts so clients reach their goals. Finishing B.S at William Paterson University for Exercise Science. George Tsemberlis has been providing clients with personal training services in Wayne, Montclair, Little Falls, Verona, Caldwell, Cedar Grove, Clifton, Nutley, Livingston, Millburn, Fairfield, Rutherford, Jersey City, Hoboken NJ and New York City for over 10 years. 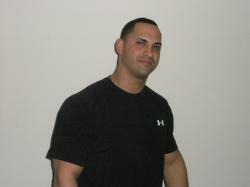 As a Personal Trainer he has worked with people of all ages, sizes, and athletic abilities. George Tsemberlis will show you how to put you in control of your body's metabolism. We want you to be the next success story! Services we include are customized personal training programs, new exercises strategized for your body type, optimization of calorie intake and output, nutritional and lifestyle counseling. GT Fitness Concepts' can also assist with Weight loss, body sculpting, strength gaining, performance enhancement, pre-post natal and post injury rehab.